The Knitting Pirate » In Which the Pirate Loves Colour. In Which the Pirate Loves Colour. My stash, especially the handspun and fibre collection, has a lot of blues, greens, browns and neutrals in it. I can't really wear the warmer colours well, but every so often I'm drawn to a bright orange or crazy colourway. 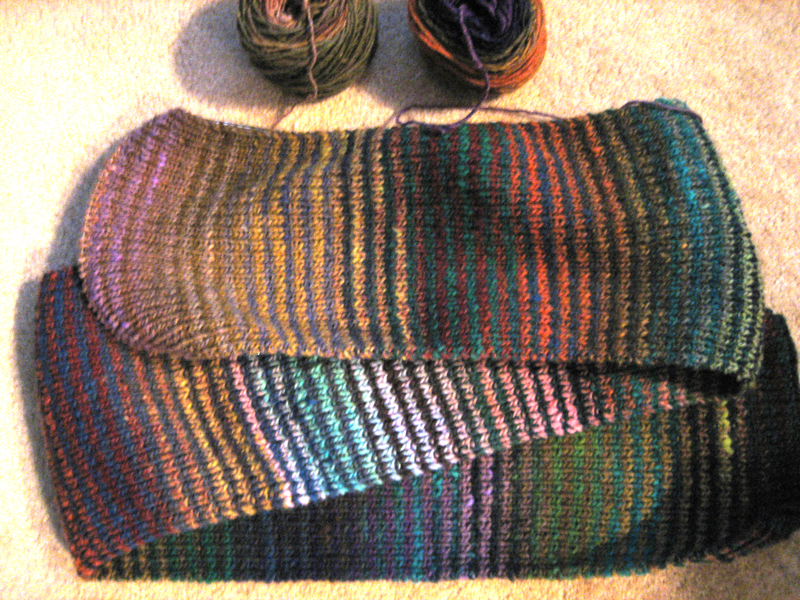 In fact, when I picked the six balls of Kureyon that I used for the Stripey Striped Scarf, I deliberately chose colourways that I thought would clash. (I know, Kureyon can clash with itself, but I really went for the parrot-on-crack and clown-puke colourways.) They turned out to go together fairly well, which was a pleasant surprise that I try to remember when looking at braids of combed top at Sheep and Wool festivals: colours that look wrong in the braid or skein often look perfect in the finished yarn or project. Other than that, I've done lots of socks, scarves and hats, and I rarely stick to the colour specified in the pattern. I try to pick patterns that will go well with the colour of the yarn, like using self-striping yarn for Jaywalkers or adjusting the number of stitches in a washcloth to get an argyle pattern. I don't wear warm colours well, so I try not to use them in projects that will go near my face - but reds and yellows and oranges look great on socks, so I'd use them there. My favourite colours are green and purple, and I love them together, but I don't love wearing them together. The latest washcloth, though, is a perfect dusty greens and purples blend. Speaking of blue jeans, as anyone who's ever been yarn shopping with me knows, when I look for sock yarn I almost always try to pick colours that will go well with them. 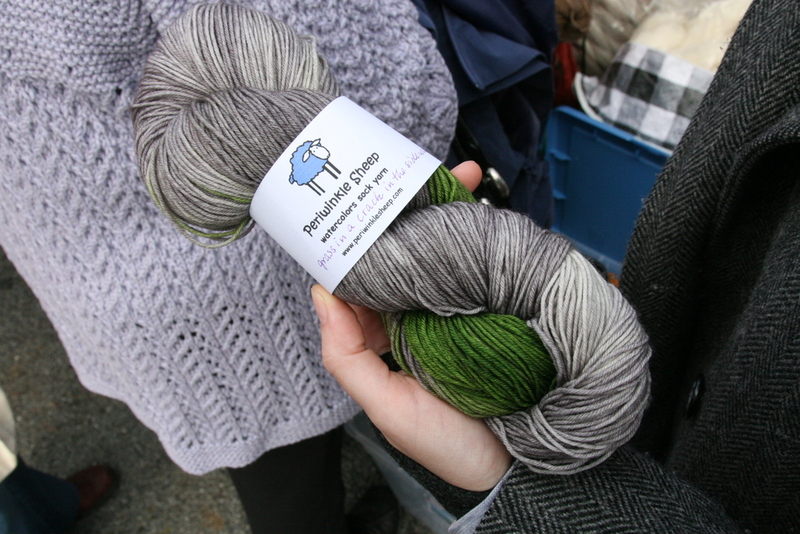 This is a skein of Periwinkle Sheep, my only purchase (besides lunch) at Rhinebeck last year. I think it will go especially nicely with dark jeans. Goodness knows when I'll get around to knitting it up, or what pattern I'll eventually choose for this yarn. 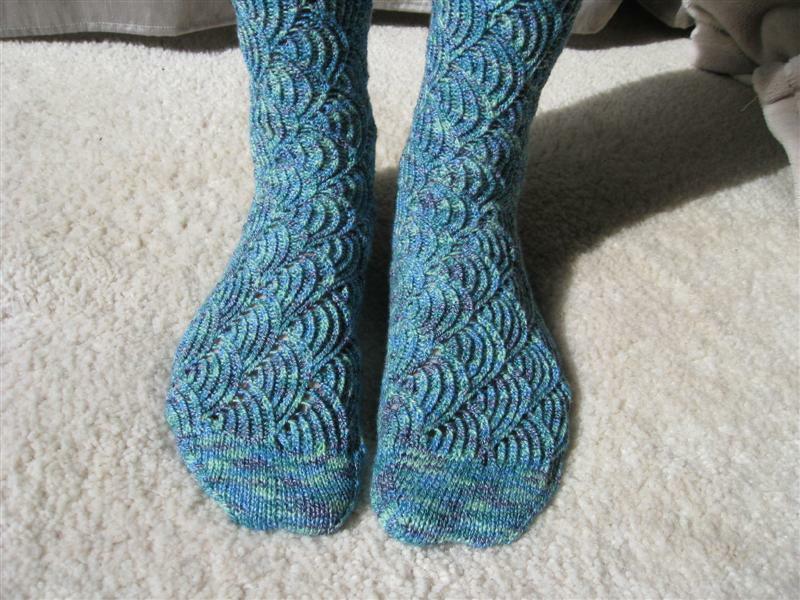 The green will spiral up and around the foot and leg, so I don't think a complicated pattern would work well. Maybe I'll use coordinating solid green yarn for the heels, toes and cuffs, and try an afterthought heel for the first time, so as not to interrupt the spiraling pattern. To read what other people are writing for today's prompt in Knitting and Crochet Blog Week, search Google for 3KCBWDAY1 or simply click here. This entry was posted on Monday, April 23rd, 2012 at 09:00 and is filed under Blog Week. You can follow any responses to this entry through the RSS 2.0 feed. Both comments and pings are currently closed. 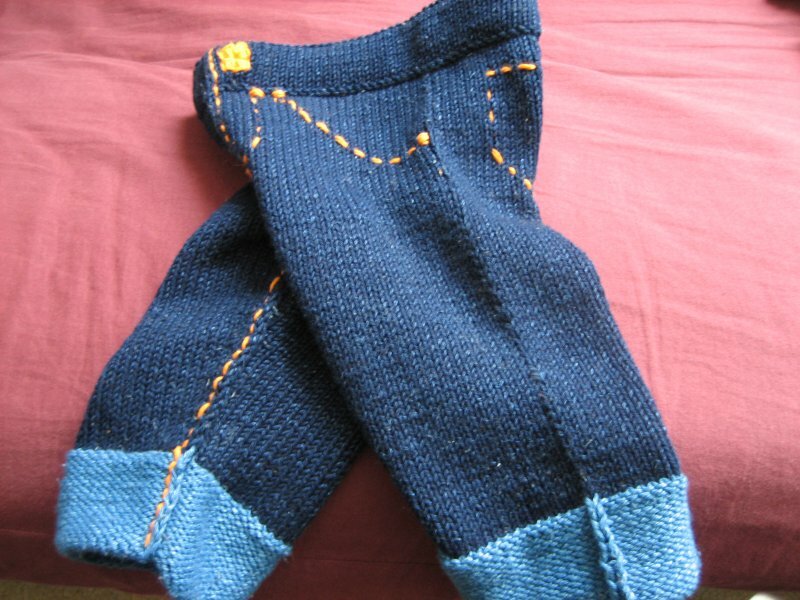 Ooh, so it would - now you've got me thinking about making armwarmers or a hat instead of socks! You are so lucky to have gone to Rhinebeck! I cannot even begin to imagine the amount of restraint it must have taken to only buy one thing! Also, you take lovely photos, you should make them slightly larger in your posts to showcase them more. You can click on each picture to see the full size. I had been keeping them small for people with limited bandwidth, but you're right, I could probably size them up a little bit more from just the thumbnails. I love those jewel colors and neutrals too! Love looking at your handspun - I really need to get back into that!! I'm trying to set aside one day a week for spinning, but I admit I'm really no good at keeping to the schedule. I like how you put thought into matching a skein of yarn with a project. I kind of do that. Sometimes a yarn doesn't look good with a stitch pattern and it's just meant for something else. Love those little denim jeans....very clever! Isn't it great to get a nose at other people's stash and see how their brains work? Great post! I wish I had a picture of the jeans on the nieceling - perhaps when her sisters are big enough to fit into them, I'll have a second chance at a pic! I've *loved* seeing everyone's stash and colour photos.